Do you know of a non-subscription app with the same graphing capability for handwritten equations? Unfortunately the ink input area is not compatible with the new Window Ink API introduced in Win 8/8.1/10 . The current workaround is to use the Math Input Panel in tandem, but I've been looking for a all-in-one solution ever since. Does it now work to toggle touch with both the tray icon and the hotkey? By the way, I removed a lot of coding that didn't belong to Windows 10. Also, if you prefer to use a .exe file, I'd be happy to compile this .ahk file into a .exe file. It works perfectly @lblb, thank you! I already had AHK installed and have made a few simple scripts of my own, so I know how to convert it .exe myself. So this new ahk script (or .exe once I convert it) will replace the initial Tray Touch Toggle.exe file and I can delete that one now that it's installed - correct? Also, if I wanted to replicate this same setup with a hotkey on another Windows 10 PC, should I still use the original .exe file for the initial installation, and then replace it with this updated one after that? Or would this revised script/exe accomplish the installation without needing to do that? I plan on setting this up for some of my family member's Surface Books too. Looks like when converting the new ahk script to .exe I had to also include all the installation files (.ini, devcon, icons, etc.) in the same directory as the ahk file. So I'm assuming the new .exe file I converted also includes everything needed for installation on another Windows 10 device and I can skip using the original .exe for the install. ... @Marty : Sorry for this delayed response; life's been busy lately. There appear to be several "free" Windows 10 graphing apps (just Google), but I don't know if any of them have a handwriting front-end. My experience has been almost entirely with paid / subscription apps and mostly with just two developers. 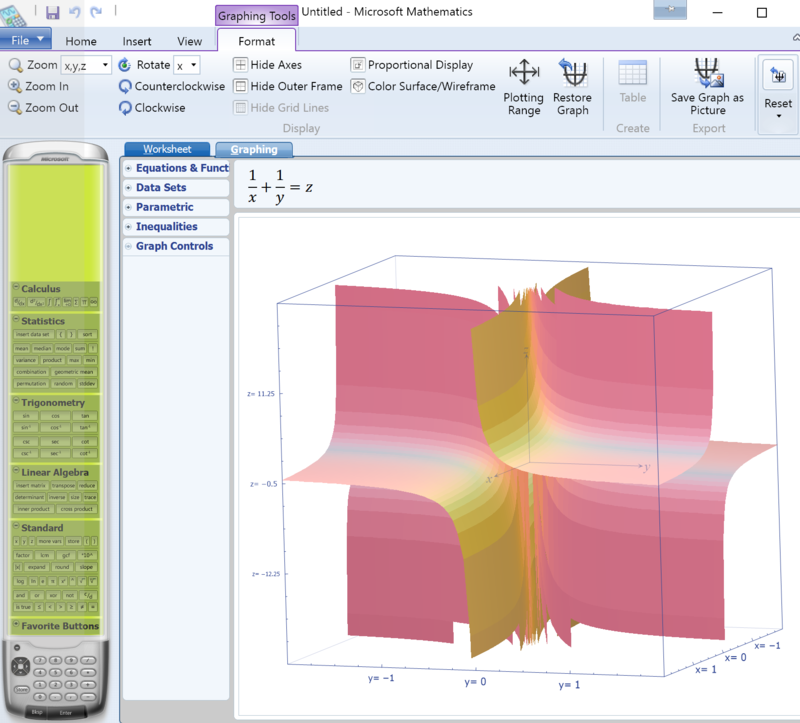 Fluidity Software makes FluidMath in both a stand-alone and an Internet-based version and xThink makes MathJournal and Calculator; MJ and Calculator are stand-alone and there used to be an Internet-based version of MathJournal... I think. Both FM and MJ feature graphing functionality, some of it quite ambitious. Of the two, FM is that more modern application, but both FM and MJ appear to be in maintenance mode these days with no major upgrades planned (as far as I know). Both are Win10 compatible. And both are paid apps. I have never objected to that fact because math solvers are something of a niche application in the US (in part as the result of the last several decades of US public education) so developing this software is definitely a labor of love and shouldn't be expected to be free. Having extensive experience with both, I (currently) prefer FluidMath, and I willingly pay the yearly $125 subscription for it. However, MathJournal has a larger (and impressive) span of capability and a one time (but more expensive) charge; but it's also a more finicky and eccentric app. Years ago, I observed some odd bugs, but perhaps the have been squashed in the intervening years. 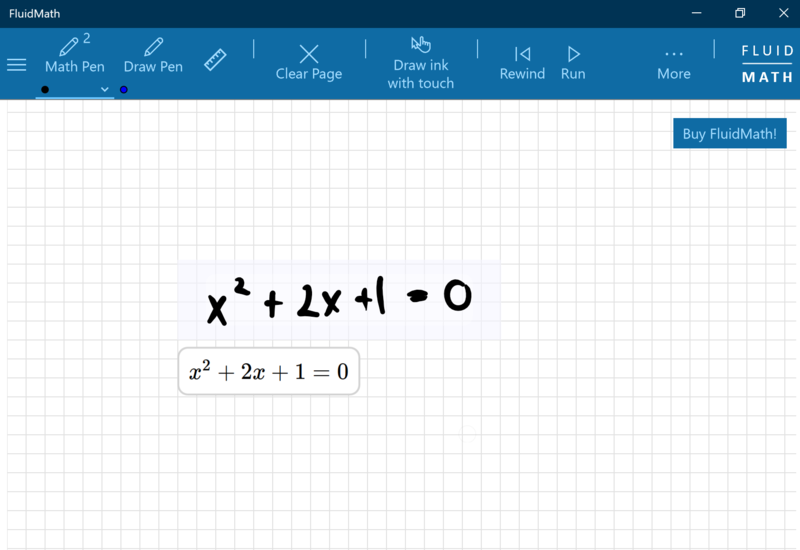 I've also tracked Microsoft's efforts over the years (MathPad was it? ), but I never felt like their effort was more than superficial. 've also tracked Microsoft's efforts over the years (MathPad was it? ), but I never felt like their effort was more than superficial. Actually, MS Math was rather good; I still use it as a lightweight graphing calculator. "MathPad" I think might be referring to MathPaper by MS Research. The IP behind this was actually acquired by FluidMath, so it is indeed a small world for math inking software . Having tried it out a bit, the ink recognition leaves a lot to be desired. I find the native Math Input panel to be far more accurate. For FluidMath, I tried the WindowsStore app trial, it recognizes my handwritten equations, but no option appears to graph them. …My recollection was that the Internet version didn't support graphing (or maybe it was a feature of the up sell?). Anyway, that's why I didn't mention anything about it and only talked about the full-scale version of FluidMath. My recollection was that the Internet version didn't support graphing (or maybe it was a feature of the up sell?). I didn't even see an upsell feature on the UWP app, just a option to remove the 15-minute limit if you subscribe. I'm trying to locate the installer for the x86 version, but I can't seem to find it. What about 3D plotting? Could you upload a screenshot of what a typical handwritten equation to 3D graph would look like? I'm trying to use the Taskbar Shuffler 1.2 on the latest update on Win10, and when I try to run it, it either does nothing or I get a pop-up message that says "Could not close the previous instance of this script. Keep waiting? Does this work with Win10? I would really appreciate such a program as I have a Lenovo Yoga 730 and I hate that I have to manually change the taskbar setting each time I use the laptop in portrait tablet mode.